Editors Note: We don’t get to the West Coast as much as we’d like, so when guest blogger Sara S. offered to write this little piece we jumped at it! Let us know what she missed and what we should add to the list! This post includes sponsored links. Thinking of heading to the west coast for a little getaway? Of all the places to see in the US, California is by far one of the best destinations to check out. When most think of California, they think of surfers, beaches, the rich and the famous. However, as one of the most populous and diverse states in the country, you might be in for a surprise. The second largest city in the country, Los Angeles is one city in California everyone wants to visit. Known as the mecca of America’s entertainment industry, a trip to this beautiful town could result in a celebrity siting. Whether you visit West Hollywood and take a stroll down the Walk of Fame, go on a tour of celebrity neighborhoods, or you want to go shopping on the famous Sunset Boulevard, there is a lot of fun to be had in the city of Los Angeles. The epitome of life in Sunny California, from the sunny beaches and designer boutiques to its wide, palm tree filled streets and timeless history, Los Angeles is a great city to visit. Some must-see tourist sites include Venice Beach, Santa Monica Beach, the LA Philharmonic Walt Disney Concert Hall, the Huntington Botanical Gardens and La Brea Tar Pits. With Disneyland located just 30 miles away, families are sure to have a great time vacationing in Los Angeles. Whether you like to go hiking and explore nature, parks, mountaintops, and gardens or you prefer to get a tan and catch some waves at the beach or sit poolside in your lavish hotel, you can find something enjoyable to do and see in the above-mentioned Californian cities. Be sure to check for great deals online so that you can explore the west coast without breaking the bank. Please note that external links do not imply endorsement. Please review our disclosure policy here. Without a doubt there is a ton to do in New York City – the question is usually where to begin? For me, one of the greatest joys of traveling is the food. I LOVE local, interesting cuisine and restaurants. That doesn’t necessarily mean pricey though – especially in a big city like New York. Eating like a local in New York doesn’t have to break the bank, especially if you’re interesting in something as ubiquitous and typically NYC as a slice of pizza. The moment you walk out of most of the hotels in NYC you’ll probably be inundated with shop windows advertising a quick bite. Pizza joints abound in New York, and while most places are decent there are some real stars out there that are worth the walk (or ride!) and may show you a different side to New York at the same time. A word to the wise: while credit cards are taken almost everywhere, have cash on hand, many small pizzerias operate on a cash-only basis. 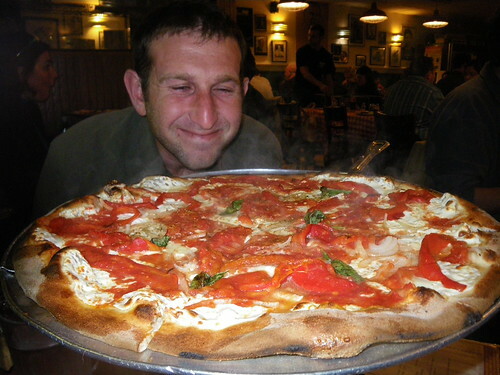 As you would expect, the FIRST pizzeria in the United States was in the Little Italy neighborhood of New York City. Gennaro Lombardi is credited with bringing this Neopolitan street food to our shores. His pizzeria still stands today, down the street from the original location, an homage to the original treat that started the craze. Address: 32 Spring St, New York, NY 10012. This place holds a special spot in our hearts as one of our regular haunts when we go to NYC to see friends. A constant contender for the best pizza in New York (ranked by The Food Network and Zagat as #1! ), this place feels more like a hole in the wall neighborhood pizzeria than a #1 pick. The pizza however will change your mind – every single time it is delicious. The original location, underneath the Brooklyn Bridge is a bit of a mission – there’s almost always a long line and a no reservations, no slices rule – but it’s worth it just for the pizza. Address: 1 Front St, New York, NY 11201. Heading uptown to East Harlem, Patsy’s is another original on the pizza tour list. First opened in 1933, you may be surprised by the small size of these yummy thin crust slices. Have no fear, no one will judge if you eat more than one! Address: 2287 First Ave, New York, NY 10035. Our NYC favorites aren’t the only places to go for a slice in New York – there are plenty of delicious neighborhood places throughout the city so if you find yourself across town and looking for a quick bite don’t hesitate to stop someone on the street and ask where you can grab a slice! We’ve had some pretty crazy pizza’s over the years – so if you got here looking for interesting pizzas, don’t miss this post on Everglades Pizza! Heading to NYC in the Spring or for a weekend? Don’t miss our Springtime in NYC post and our Weekenders Guide to NYC.